Ghanaian comedian Derick Kobina Bonney, better known as DKB delighted former 1st lady Nana Konadu over the weekend with a spectacular performance at her 70th birthday party. The comedian on the night was excellent with his delivery, cracking everyone present with hilarious jokes and it was exciting watching him perform. The comedian thrilled the invited guest with his witty clever jokes, as he got everyone in the auditorium laughing. DKB asked the former First Lady Nana Konadu and former president J.J Rawlings who in the relationship farted first, which Papa Jerry owned up to. There were other revelations such as the first love song Papa Jay sang to Madam Konadu, which the 70-year-old birthday celebrant did a karaoke with the entire audience. 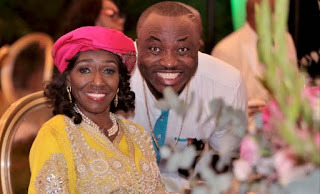 Nana Konadu Agyeman Rawlings, gave a damning verdict on Ghana’s King of Comedy, DKB, after watching his Easter comedy show somewhere 2017 at the Conference Centre. That friction was not present on the night as the comedian displayed so much professionalism and creativity to ascertain a different perception and indeed, he achieved it. In a video sighted by Remedi Entertainment, one can see the birthday celebrant enjoyed every bit of the performance. DKB after his performance took to his twitter handle to disclose the good news which he couldn't hide. The monthly comedy show Comedy Express which DKB is a regular performer, comes off Saturday December 1st, at the cockpit bar and lounge inside the Achimota mall.